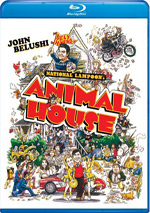 National Lampoon’s Animal House appears in an aspect ratio of approximately 1.85:1 on this Blu-ray Disc. The Blu-ray gave us a bright and shiny image – probably too bright and shiny for this particular film. Animal House was shot more than 30 years ago on the cheap, so one would expect a certain grittiness to it. That wasn’t the case with this slick transfer. It seemed somewhat processed and removed most of the film’s natural – previously prominent – grain to seem superficially attractive but not what I would view as a good representation of the source. Not that it was a Predator-level alteration, but the image seemed too peppy and clear for Animal House. Which means it’ll really appeal to some viewers and really turn off others. Sharpness was usually pretty good. I noticed a fair amount of edge haloes, and the image could look too smooth at times, which resulted in a lack of detail. Nonetheless, overall definition was fairly positive, and no issues with jagged edges or shimmering occurred. Print flaws were negligible, as I saw a couple of small specks but nothing else. Colors fell into line with the rest of the image, as they were rather peppy. They seemed brighter than they probably should, which left them as attractive but a little too glossy for this particular movie. Blacks were pretty deep and dense, but shadows tended to be somewhat dense and thick. While I thought the transfer looked good enough for a “C”, it disappointed since it appeared to clean up and brighten the image more than it should. The Blu-ray included a DTS-HD MA 5.1 soundtrack that reworked the original monaural audio. This remix failed to reinvent any wheels. The side speakers featured some mild stereo imaging for music, though only Elmer Bernstein’s score offered genuinely positive delineation; the pop songs heard on the track sounded more like semi-stereo to me, as they spread to the sides but failed to display clear separation. How do the picture and audio of this Blu-ray compare to those of the prior 30th Anniversary Edition? The audio seemed comparable, as there wasn’t much a lossless mix could do with decades-year-old material that wasn’t all that high-quality in the first place. Unfortunately, the Blu-ray dropped the DVD’s original mono track. As for the visuals, they were stronger on the Blu-ray, though not necessarily more appealing. The DVD was uglier but probably more representative of the original photography. It’s up for grabs which you’d prefer; the Blu-ray’s more attractive but those “improvements” come with a price. The Blu-ray includes the same extras as the “30th Anniversary Edition” plus some new material. First we find an Animal House edition of the game Scene It?. This is meant to be played with partners and offers a mix of questions about the flick. We also get some minor trivia facts about the film as well. The game provides moderate fun, but its inclusion here almost feels more like an ad for the Scene It? series than an actual bonus feature. Don’t expect much from it. In addition to the film’s trailer, we get the 23-minute and 23-second Where Are They Now? A Delta Alumni Update. Landis tells us that he wants to update his “documentary”, so we find out what happened to some of the movie’s characters. I won’t tell more than that since I don’t want to ruin surprises, but I will say that it’s amusing and a lot of fun. Next we get a documentary called The Yearbook: An Animal House Reunion. This 45-minute and 19-second show mixes movie clips, archival elements and interviews with director John Landis, producers Ivan Reitman and Matty Simmons, writers Chris Miller and Harold Ramis, Executive in Charge of Production Sean Daniel, head of production Thom Mount, script supervisor Katherine Wooten-Beattie, casting director Michael Chinich, editor George Folsey, Jr., John Belushi’s widow Judith Belushi Pisano, costume designer Deborah Nadoolman, composer Elmer Bernstein, and actors Kevin Bacon, Peter Riegert, Karen Allen, Stephen Furst, James Widdoes, John Vernon, Tim Matheson, Mark Metcalf, Verna Bloom, and Bruce McGill. “Yearbook” looks at the project’s origins and script development, getting backing for the flick and bringing Landis on board, cast, characters and performances, locations and anecdotes from the shoot, Landis’s work on the film, editing and score, and the movie’s reception/legacy. Two features appear under the U-Control banner. This allows for interactive access to the components as the movie runs. “The Music of Animal House” provides simple credits for the songs that we get in the film. The pop-up captions tell us the names of the tunes as well as the performers. It’s a lackluster addition. Video footage shows up within the “Scene Companion”. This presents comments from Simmons, Reitman, Miller, Landis, McGill, Furst, Widdoes, Vernon, Riegert, Matheson, Belushi Pisano, Folsey, Allen, Bacon, Ramis, Bloom, and Metcalf. “Companion” simply takes clips from “Yearbook” and spreads them out across the movie. That makes it redundant and not especially useful. The Blu-ray continues to leave off some features from earlier DVDs. It drops a subtitle commentary, a music video, and some text components. The omission of these components surprises – and disappoints – me. I especially miss the subtitle commentary, as it was pretty good. One of cinema’s enduring comedy classics, I think National Lampoon’s Animal House holds up pretty well after more than 30 years. While I don’t believe it’s quite as good as its legend indicates, it does amuse. The Blu-ray offers inconsistent picture that tends to look a bit too spiffy along with decent audio and some good supplements. This isn’t a bad release, but the peppy/shiny visuals – and continued absence of previously created extras - make it less satisfying than I’d like.